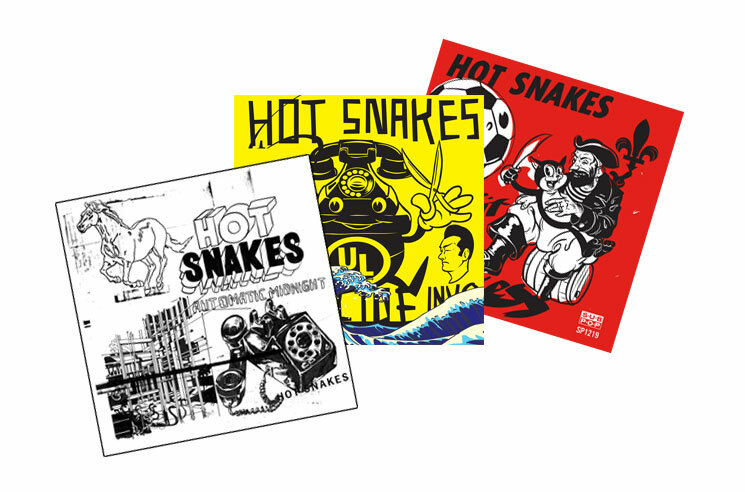 Back in August, Hot Snakes announced they had signed to Sub Pop ahead of releasing their first new LP in 14 years. Ahead of the new disc's arrival, the group are set to look back on their discography with a reissue campaign through their new label home. The band's 2000 debut Automatic Midnight, 2002's sophomore Suicide Invoice and 2004's Audit in Process will all be reissued through Sub Pop on CD, vinyl, cassette and digital formats come January 19. The albums are currently available for pre-order here. The first vinyl pressing of each album will arrive on coloured wax (Automatic Midnight on orange, Suicide Invoice on yellow, and Audit in Progress on pink), and will include a set of six stickers designed by the band's Rick Froberg. A press release notes that Hot Snakes' new album is pegged for a "somewhat-later-in-2018 release." The band kick off a short U.S. tour tomorrow (November 8), and you can find further details on that trek here.